The 10 Best Christmas Tree Farms in Maine! Maine is New England’s top Christmas tree grower, harvesting close to 200,000 trees every holiday season. Most Mainers don’t live too far from a cut-your-own Christmas tree operation or a store that sells them. For wreaths, kissing balls, garland, and a magical tree to top everything off, check out these 10 wonderful Maine Christmas tree farms! Open Black Friday through Christmas Eve, the Holmes Tree Farm is a family-owned and operated farm since 1742. The 65-acre farm sells primarily balsam fir trees along with balsam wreaths, kissing balls, garlands, and specialty wreaths. You can either cut your own or buy a pre-cut tree. Santa is always at the farm on the weekends where the kids can sit on his lap and get a free candy cane. Their country gift shop is filled with lovely Maine-made products and gifts. The mulled cider is always free! For close to 25 years, Christmas trees have been growing at Balsam Ridge in Raymond. During the winter and early spring months, they also make maple syrup. 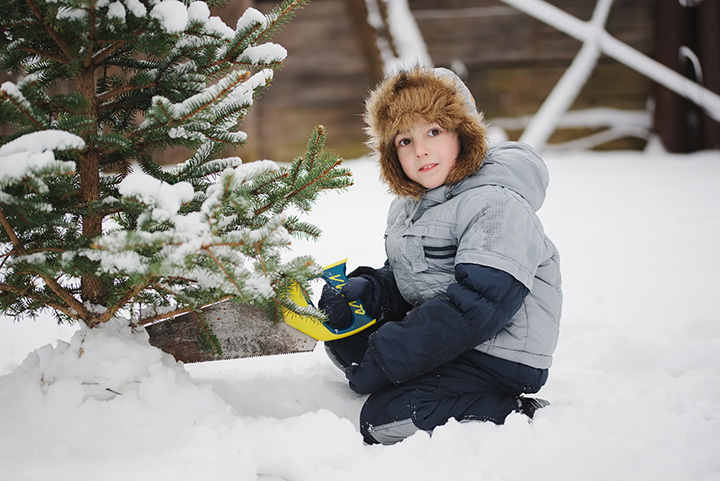 They offer acres of balsam fir, Fraser fir, and balsam/Fraser mix fields where you can cut your own tree or you can purchase a pre-cut Fraser fir tree up to 10 feet-tall. Their gift shop is full of maple syrup, maple treats, and more. Ginger and Rex, the resident horses, often greet visitors and Santa makes an appearance on Saturdays. Situated on 185 acres of rolling hills in Newburgh, the Piper Mountain Christmas Tree Farm is right out of a Norman Rockwell painting. You can choose from your choice of perfectly pruned Christmas trees and the farm will wrap it for you. Their large gift shop is whole of ornaments, gift baskets, wreaths and more. On the weekends, you can enjoy homemade donuts, horse drawn carriage rides, and Christmas carols sung by Hampden Maine’s choir. Through Dec. 23, the Old Farm Christmas Place of Maine offers choose-and-tag, cut your own trees, or a pre-cut tree. The farm will even delivery to your house! You’ll also be able to buy all your wreaths, garland, kissing balls, and fresh local balsam boughs. Enjoy wagon rides, hot cocoa, a warming fire with marshmallows, and more. The Olf Farm is all about creating family traditions. Located in Central Maine, Finestkind Tree Farms opens for business on the Saturday after Thanksgiving so you can choose and cut your own tree as you prep for the holidays. Their Christmas gift shop sells centerpieces, garland, wreaths, and more. The farm will bale your tree while you sip on a cup of hot coffee. Nutkin Knoll Farm is a small family farm in Newburgh. They grow lovely Christmas trees, handcraft Balsam Fir, and produce the sweet Maine maple syrup that you’ll pour on your pancakes on Christmas morning. For every tree harvested, they plant an additional two to three every spring. Located in Norridgewock, Trees to Please is a tree nursey specializing in balsam fir and Fraser fir Christmas trees. Starting Black Friday, you’ll be able to cut your own tree or enjoy the ease of taking home a pre-cut tree. Better yet, take home a potted tree and plant in your yard afterward! Their gift shop is full of Christmas decorating goodies and local gifts. Nestled close to the New Hampshire border, Tuckaway Tree Farm not only sells Christmas Trees, but wood turns incredible gifts that anyone will love. Seven of their 27-acre tree farm is cut-your-own balsam Christmas tree farm where the rest of the farm grows softwood and hardwood trees. In their farm store you’ll find handmade gifts, hot cider, and plenty of cookies to enjoy. Located in Northern Maine, Pleasant View Tree Farm is open November through Dec. 23 for all your Christmas needs. The farm sells choose and cut and pre-cut trees to visitors as well has offers wholesale and retail in case you need lots of tree. Ledge Hill Farm is a family-owned choose-and-cut Christmas tree farm specializing in balsam and Fraser fir trees. The 15-acre tree farm has incredible panoramic views of Mount Washington and the western mountains of Maine. While the farm is open up to Christmas Eve, the farm often sells out sooner so get your tree early.